It’s a great collection of companies, tools, games, platforms, frameworks and more all associated with Node.js. 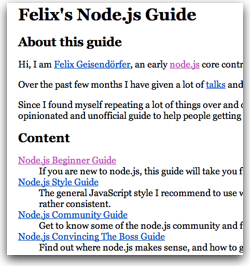 While Joyent also maintains a list of Node.js resources, this list from Stanislav Stoyanov contains many excellent pointers for those looking to learn more and get started with Node.js. 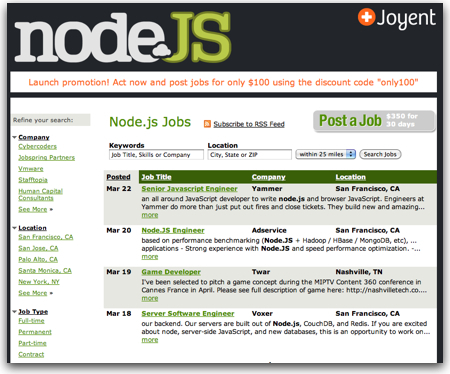 This entry was posted in Node.js and tagged Node.js on April 10, 2012 by Dan York. I am still an employee at Joyent and will advise from the sidelines but I won’t be involved in the day-to-day bug fixes. Isaac has final say over what makes it into the releases. Appeals for new features, changes, and bug fixes should now be directed at him. I’ve been a huge fan of Node.js and if you look at the tag cloud in the right sidebar you’ll see that “Node.js” stands out with the largest lettering and denoting the most posts written here. My post on “Node.js, Doctor’s Offices and Fast Food Restaurants – Understanding Event-driven Programming” remains one of the most visited posts on this blog. And I continue to routinely find new and interesting ways to work with node.js. I also learned a great bit from the various videos of Ryan’s presentations (such as this presentation). Kudos to Ryan for creating Node.js and then taking it as far as he has. I can completely understand how after three years of rather intense work he wants and needs to pursue a different path. His departure is also a huge statement about the power of the Node.js community – and also of Joyent as a sponsor and employer of so many key Node.js developers – to continue the development of the language without the creator at the helm. As just a random developer out there using Node.js, I certainly thank Ryan for all he’s done and wish him all the best in his new role! UPDATE: Jolie O’Dell over at VentureBeat also has a nice post out about Ryan Dahl’s stepping down. This entry was posted in Node.js and tagged Node.js on January 30, 2012 by Dan York. Node.js Knockout Contest Coming Up August 27 – Will You Compete? Do you know Node.js? If so, have you thought about joining the Node.js Knockout contest starting on August 27th? It’s basically a 48-hour contest to see which team can create the most awesome Node.js application, as decided by a panel of judges. The contest rules explain all the details and as I write this post there are 321 teams entered in this year’s event. Teams can be virtual – and some are gathering in various locations around the world to hack in the same physical place. There is apparently still room to sign up, although it’s closing soon (8/20). While I’m not personally joining this year, I’m looking forward to seeing what these teams come up with. It should be fun to see! P.S. In full disclosure, I should note that Tropo.com, one of the services of my employer, Voxeo, is one of the sponsors of the Node.js Knockout. This entry was posted in Events, Node.js, Programming and tagged Node.js on August 12, 2011 by Dan York. Calipso is a content management system (CMS), based on the NodeJS server. Due to the asynchronous nature of NodeJS, it seemed like a good idea to try to build a CMS made up of modules that could execute asynchronously in a non-blocking way. This is the start of that journey, we are in the early days, so be patient, but feedback is always appreciated! While right now I will stick with WordPress as my CMS for this site (primarily because I barely have enough time to write, let alone work on the backend of the site), it’s good to see someone working on a Node.js-driven CMS and I’ll definitely keep watching its evolution. Cool to see! This entry was posted in Node.js and tagged CMS, Node.js on June 17, 2011 by Dan York. This server has received 5726589 hits from both ipv4 and ipv6.